Snow Blanche is a multiple award-winning witbier from Konishi Brewing. It is brewed with fresh orange peel and coriander, along with the regular ingredients of malt, barley, and wheat. Snow Blanche is available both in bottle and also in keg forms. If the picture is not clear enough, this beer also took the gold medal at the EBS awards in 2013 for best Belgian-style wibier. 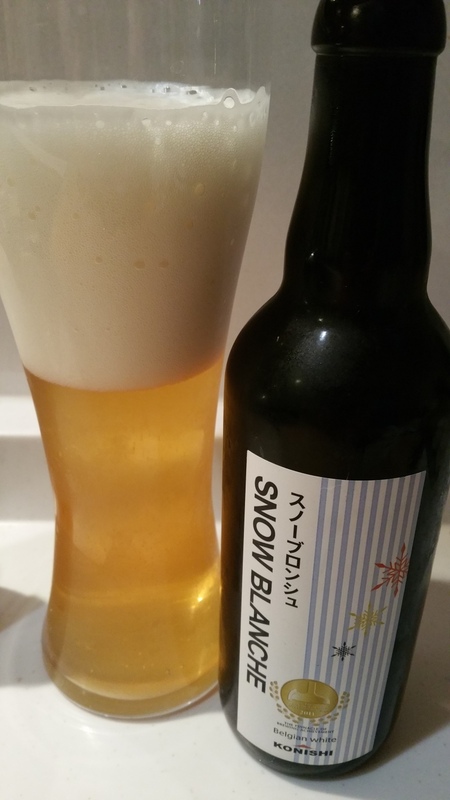 Snow Blanche, aka Shirayuki Blanche, won a gold medal in 2013 in the Belgian-style witbier category at EBS. I haven’t had much luck with beers recently. They either seem to explode out of the bottle or are as flat as a pancake. Snow Blanche wasn’t much better and was 50% beer and 50% head. The body of Snow Blanche came out a clear, golden-yellow colour that was topped off with a creamy white head. Bananas and cloves were emanating off the beer but I was disappointed as I was hoping for some orange and coriander notes. The hardest thing about writing beer reviews is sometimes insipid beers don’t really inspire you to write something. I could write lots about how Snow Blanche tastes of bananas and cloves, and I would be right but it doesn’t seem to push the boat out. Everything seems to be by the numbers. The only real problem with this beer is the lack of kick to it. This isn’t meant as a bad thing, but for something that has won awards, expected something outstanding. Snow Blanche is a great introductory beer to the world of witbeer, or wheat beers, but is fairly bland as everything is done by the recipe and lacks invention. Snow Blanche can be bought at Queen’s Isetan across the country.